Today, you are going to learn how to do it. 1. Firstly, of course, you have to make sure the bookmarks toolbar is displayed. Just right-click the space after the ‘Help’. 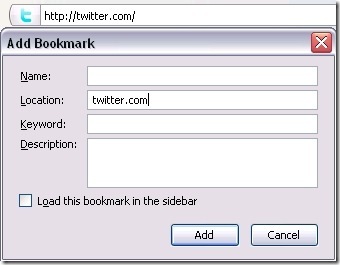 Then, click on ‘Bookmarks Toolbar’ to activate it. 2. Now, the bookmarks toolbar will be displayed. You might see some bookmarks there already, so remove it if they’re not your favorite sites. 3. Right-click on any empty space at the bookmarks toolbar. Then, click on ‘New Bookmark’. 4. Be sure whether the site has a ‘www.‘ Most sites have it. If a site don’t have a ‘www.’, just enter the site address without it. Gloson Blog doesn’t have a ‘www.’. Do not enter the name. I will tell you why later. If the site has a ‘www.’, just type the site address with it. Do not enter redirects (e.g. www.wikipedia.com. The address is www.wikipedia.org) In other words, just type the exact address. 5. Click ‘Add’ to add the site to the bookmarks toolbar. Why should you type the exact address? It is because if you don’t, the favicon won’t show. A favicon is an icon which is displayed at your bookmarks. If the favicon still doesn’t appear and you have followed the instructions above, either the site doesn’t have a favicon, or you haven’t visited the site. Now, why shouldn’t you type the name? It is because if you do, there will not be enough space for all of your websites. But if you think you should type the name, just do it. 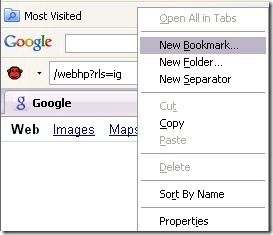 To edit a bookmark, right-click the bookmarked site. Here, you can add/remove the name or change the URL. If you remove the name, only the favicon will show. This also works in Google Chrome. Right-click the bookmarks bar. (That’s what Chrome calls it.) Then, you click ‘Add page…’, then follow the same instructions above. 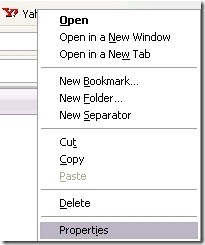 If you middle-click a bookmark, it will open inn a new tab, I find this shortcut convenient. Now, all you have to do is to keep adding your favorite sites, maybe until your bookmarks toolbar is full! And your sites would be just a click away.